Are Chemical Drain Cleaners Bad For Your Plumbing? Some of those who are suffering from a clogged drain and would rather not call a plumber may be tempted to try their luck on chemical drain cleaners, such as Drano or Liquid Plumr. We’re here today to beg you to please refrain from sticking any chemicals down your drain that may be harmful to your pipes or plumbing fixtures. Chemical cleaners are normally pretty ineffective, and even if they did work, that doesn’t excuse the fact that these cleaners are harmful to the environment, your pipes, and even household pets and children. If chemical drain cleaners are poured in the toilet it can set in the porcelain, which normally isn’t very good for the toilet. The chemicals can heat up the porcelain, which can cause the toilet bowl to crack, forcing the homeowner to have to replace their toilet and install an entirely new one. If you’re lucky and the toilet does indeed hold up, the chemicals will still be settled into the toilet, and if ever there comes a time where you decide to add additional chemicals to the toilet, there is always the risk of a chemical reaction, which can be very dangerous, and at their most extreme, could cause an explosion in your house. 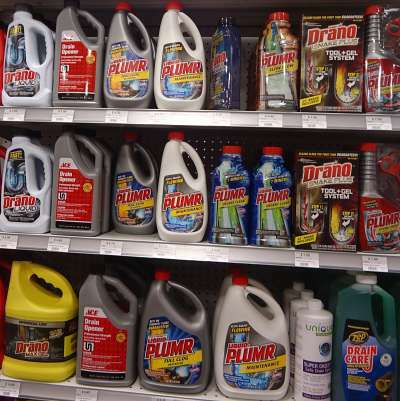 Most liquid drain cleaners use oxidizing chemicals which are very potent and are meant to tear away at anything in their path. Of course you can see how this may become a problem for your plumbing. For drains that lead to plastic PVC pipe, the cleaner can soften the PVC, leading to future pipe damage. Even metal pipe suffers as it corrodes away when coming in contact with these chemicals. These problems get exponentially worse if the clog ISN’T cleared by the cleaner. If that’s the case, instead of the chemicals flowing through your system, they will sit at the clogged area, eating away at a concentrated piece of the pipe, which will almost certainly destroy the plumbing. Also, having those chemicals just sit around in your pipes leaves them dangerous within reach of humans if the clog is shallow enough. Aside from being largely ineffective and an overall bad buy in the long term if you’re hoping to save money on plumbing, chemical drain cleaners are just downright harmful to anything it encounters. Keep in mind that what goes down your drain eventually ends up in sewage systems and landfills. From there, the chemicals tend to enter bodies of water like rivers, streams, and even the ocean. Of course this is problematic because it contaminates the water on Earth, which has adverse effects on plants, coral reefs, aquatic animals, and can even taint food and water supplies. On top of that, it can be very dangerous keeping such harmful chemicals around the house, given that they can seriously injure household pets and young children who are incapable of understanding the bottle’s lengthy warning labels. The Zip-It drain cleaning tool is one of the easiest clog fixes for some drains. If your shower or bathroom sink drain or is backed up, it is likely due to an influx of hair tangling together and getting caught in the pipe. All you have to do to clear that kind of clog is stick the Zip-It tool down the drain, and when you pull it back up the upward-ticking, barbed notches should catch onto the hair and pull it back up with it, if the drain is shallow enough, that is. If the clog is too deep to reach with a plunger or Zip-It then the next resort may be to snake the line with a toilet auger. What this does is break through the clog, freeing it up and allowing the loose parts to flow down the line. This requires a bit more skill to operate an auger, and if you don’t already have one, they could range from $50 to hundreds of dollars. At this point it might be most worth it to call a plumber who already has an auger and possesses the professional ability to properly use it. For a sink, you may want to try unhooking the p-trap and clearing it of any gunk and buildup. Also make sure that the pop up and drain have been cleared of any debris. If you’re adamant about not wanting to get down and dirty, and will only go as far as pouring something down your drain before you call a professional, there are still some alternatives that are preferable to chemical cleaners. The safest of which is boiling a pot of water and pouring it down the drain. Another alternative are certain liquid drain cleaners that use natural enzymes instead of harmful chemicals to eat away at the clog. These are just about as effective as chemical drain cleaners but come without any of the pipe-eroding nature-killing components.